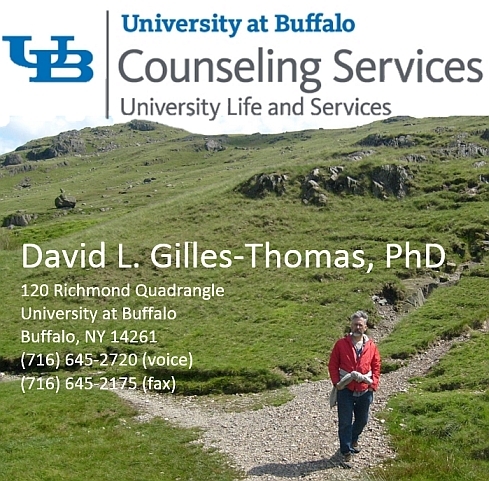 Direct Service: Individual, couples, and group therapy from an integrative orientation in a counseling center setting. Training: Supervision, training, and teaching at both the graduate and undergraduate levels. Prevention: Outreach, consultation, use of paraprofessionals and other natural care-givers, use of the Internet. Other Interests: Social justice, feminism, technology and the media in applied settings, diversity, philosophy of science and mind, community radio, the Deaf Community. Here are some of the internet projects that I have designed and maintain. I have written an article with more about the history of some of these and related websites if you'd like to learn more. Feel free to contact me if you have any feedback or suggestions. 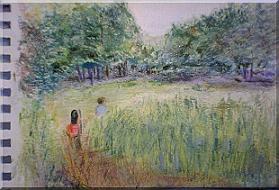 This is a web site I set up with Dr. Wendy Settle of the University of Notre Dame Counseling Center. Numerous colleagues, via ACPA's Commission VII (Counseling and Psychological Services), were involved in developing this site which went online in 1997. It is designed to be a major resource for counseling center professionals, bringing together in one web site a wide range of resources and information. This includes online psychoeducational materials, job listings, an on-line document bank, research information, materials for predoctoral training, and more. A major update of this site was made in 2017. This site was created as a place where information about the annual Counseling Centers of New York conference could be found. There are links here to other NYS resources as well. There is also information about listservs I manage for professionals working at counseling centers in New York. 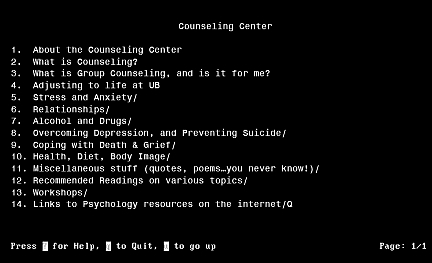 One of the first major counseling center websites, this was a directory of university and college counseling centers that had an internet presence. The Directory first went online even before there was a World Wide Web, as a purely text-based site. It soon evolved into a full website, and was able to include search and filtering capabilities. It had a good run, and was widely used for many years. But in 2017 I decided to close it down. It had become easier simply to use google to search for a school's counseling center than try to keep up with the ever changing URLs and creation of new sites. You can learn more about the Directory and view early versions of it in this article. These lecture notes were written in the late 1980's for an honors-level undergraduate course in Abnormal Psychology. Although they are based on the now outdated DSM-III-R, they still contain useful information about psychopathology, including an extensive reference list. I particularly like the lecture entitled "Mental Illness and Mouse Traps." Over the years, I have collected quotes that I have found meaningful. Since posting this to the web, other people have suggested quotes that I have included as well. Feel free to make your own suggestions. March 7, 1996 and the March 27, 1997 issues of The Reporter, our school's newspaper. December 16, 1996 issue of Student Affairs Journal-Online, "Internet Resource Review: The Counseling Center Self-Help Home Page - State University of New York at Buffalo" by Andrew J. Hedges . The Role of Student Affairs in the Virtual University, by Arnold Wade, Chair of ACPA's Technology Task Force, 1997. February 1999 issue of Interface, the University at Buffalo's Computing publication (no longer published). ...other places on the web that link to the above websites.